How to properly wish your LMS/CMS Techies a Happy Birthday! The cake? Just another creative endeavor for Melissa Miller, part of the web app team that manages the myLaSalle portal, their Blackboard app, AND the Online Help Desk. Alica, what’s in the BorgBox? Happy Birthday Alicia, from all of us! Inside the “box” are 4 layers of yummy chocolate cake! So there are two cakes? No, no… I see now, the Borg item is FLAT a folder or something for display. Ahhh. 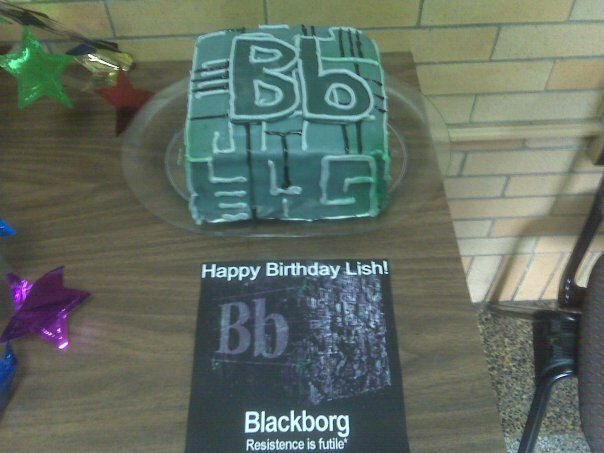 Well LeSombre, you ARE the original BlackBORG cube author! See what your fine art has begat? can we get a piece of the little b?